Shop owners are able to target wishlist users with automated messages informing customers about price changes or by sending them targeted promotions. 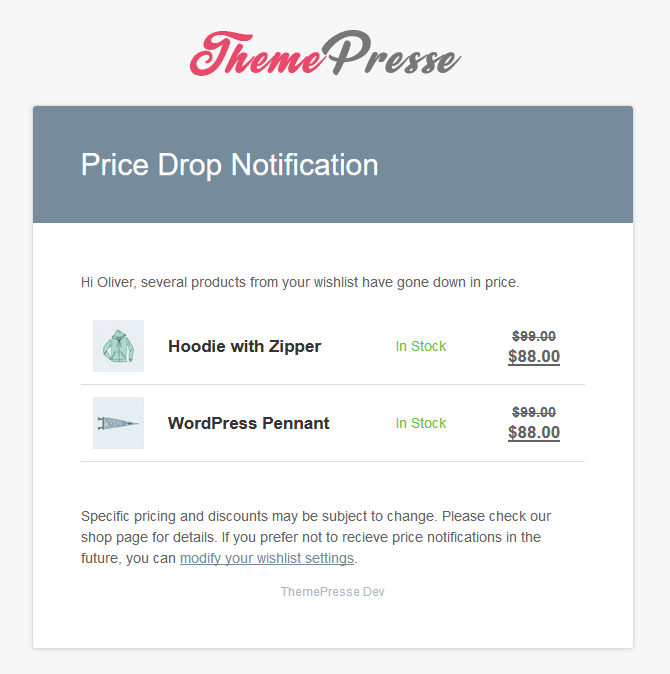 In its current state its possible to send customers price drop notifications. 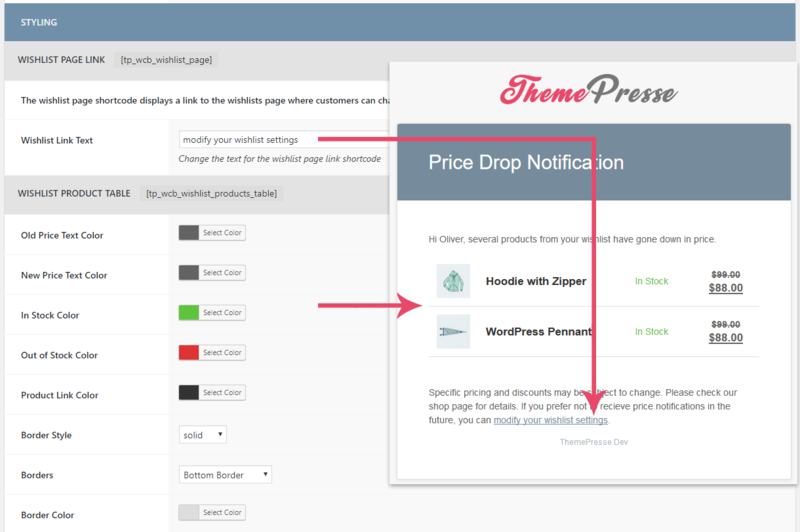 It’s also possible to manually promote a product by coupling it with a coupon code and sending out mails to customers. All of these functions take root in wishlists. 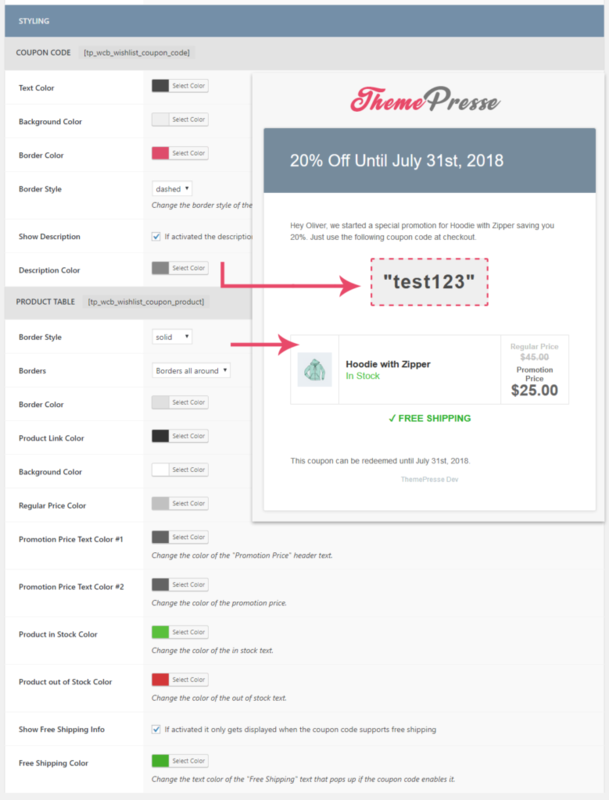 If 20 customers have a red cape in their wishlist the shop owner can use the plugin to send these people a targeted promotion either coupling it with a coupon code or informing them about an upcoming sale. Customers can opt-in or opt-out of receiving these kind of promotions for each wishlist they create. Enable or disable automated price notifications. If you disable this setting customers will not receive information about price drops or sales on products they currently have in their wishlist. Choose how many emails should be sent per hour. This setting can help to keep your mails from beeing flagged as spam. If you find that your mails are not beeing received by everyone or you get warning messages from other mail servers change this number to a lower amount. Price notifications are sent through a cronjob that runs once every hour. 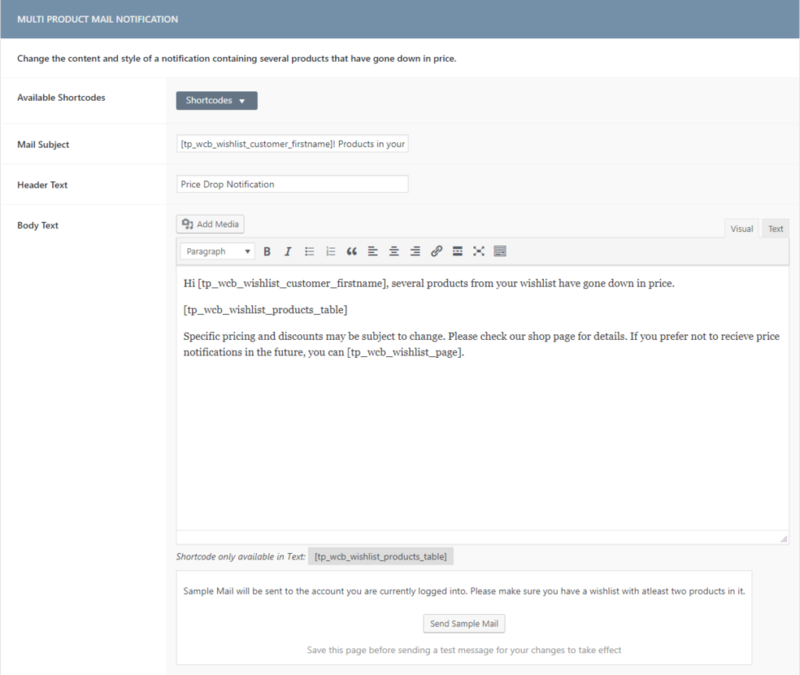 Price notifications automatically scan your products for price changes once per hour. If the price of a product drops by a larger amount then specified here the price change will trigger a notification to customers. Every sort of automated promotional mail can be modified. You can change the basic text for mails, add pictures and change colors. In the case of automated messages we distinguish between a single product that has gone down in price and several products which have dropped. The body text of the notification can take in all the above shortcodes but also offers the shortcode [tp_wcb_wishlist_products_table]. This shortcode displays a table containing a preview picture, the name, the old price as well as the new price of the product in question. 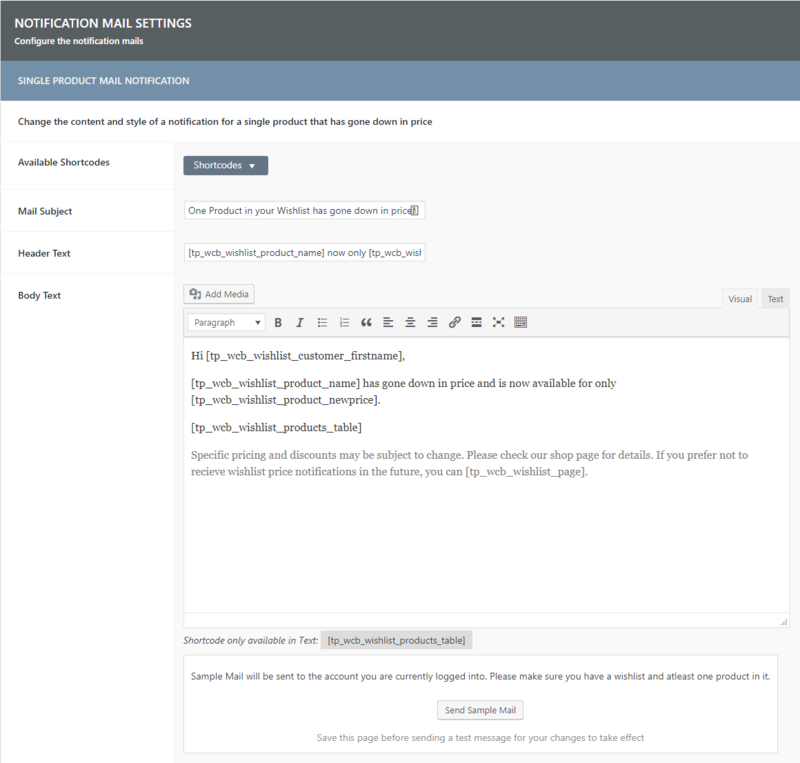 Its also possible to send a sample mail testing your changes to the shop admins mail address. In order to do this the account of the shop manager needs to have at least one wishlist with one product in it. Please don’t forget to save the current page before sending out a sample mail in order to see your changes take effect. Here is what sample mails for single products that have dropped in price look like. These shortcodes are available in all input fields. For the body text you also have access to the shortcode [tp_wcb_wishlist_products_table]. This shortcode displays a table containing information about all products that have gone down in price. Its also possible to send yourself an email with demo data to check out what the price notification for multiple products will look like in the inbox of customers. Your admin account needs to have atleast one wishlist with atleast 2 products inside of it. If you made sure that thats the case you can click on the „Send Sample Mail“ button. Please make sure that you save your changes before clicking the button, otherwise changes will not be shown inside of the sample mail. Here is what a sample email containing several products that have gone down in price looks like. You can change texts and styles used inside of the mails. Promotional mails are sent manually by the shop owner to customers. 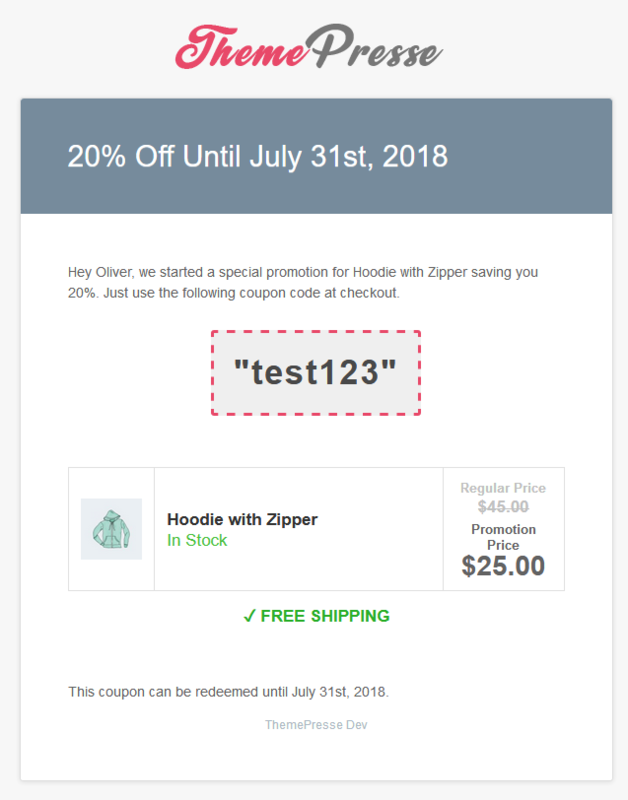 This feature was designed to be coupled with a coupon code but can also work without one. 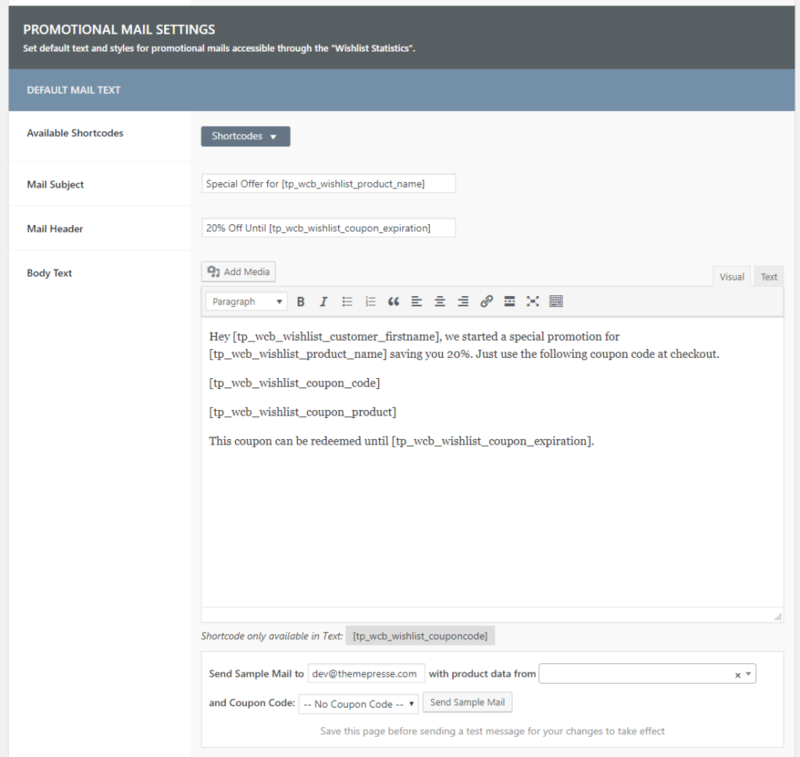 You can change the default texts for new promotional mails in the following section. You can use the following shortcodes in all text fields provided for promotional mails. You also have the option to send a sample mail to an address of your choosing. 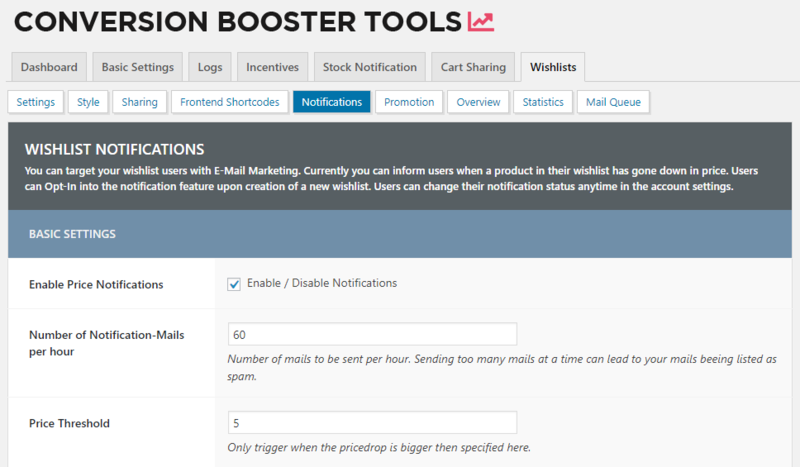 Simply select an email address, a product to grab data from, a coupon code and click on the „Send Sample Mail“ button. A sample promotional mail might look something like this. 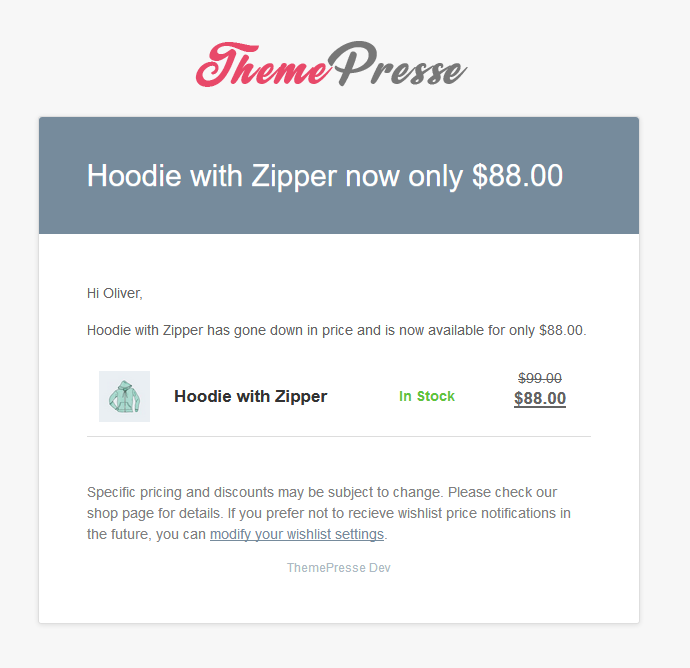 There are several different styling settings available specifically to promotional mails. You can change the colors used to display the coupon code and the product table, change border styles and choose wehter you want to display certain information or not.